A second storm blew in this morning and it brought with it rain and a blast of Christmas inspiration and the energy to actually accomplish a few of the things that I have been dreaming of. The rain was so beautiful. It drizzled for a long while, but in the middle of breakfast it came down in great, satisfying sheets of water. It was our first Saturday-home-eating-pancakes with the kitchen door open rainfall. What a great start to the day. So. I washed dishes. I did laundry and took out garbage. I showered. Seriously, this has been an amazing day. Is it the weather? Is it finally being in recovery mode? I don't want to over analyze it, but it does matter. When one feels inspired, ready and able to make pancakes and tamales on the same day, it's worth figuring out what forces are at play. I even unpacked more boxes, let Maria paint with real paints, cleaned after making tamales and sewed a patchwork scarf. And what about this bird cake? Cute. Hencakes have been around as long as Chickenblog, but a blog friend at "A Cup of Coffee..." shared the genius idea of using a squeeze bottle. We are totally hooked on the squeeze bottle. 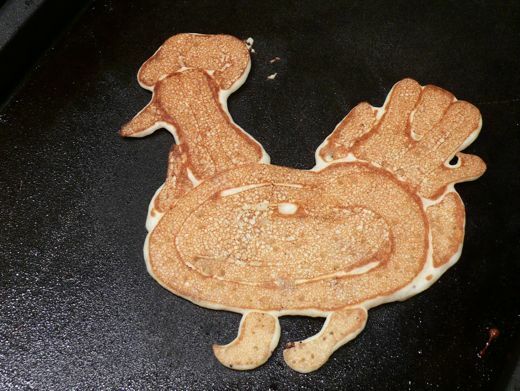 She gave Chickenblog credit for inspiring her first Zacky-cakes. I just love it when good stuff goes around. I passed the bottle to Geoff. I knew he would appreciate this creative outlet. Sure enough, out comes a Klein-cake. Not to be confused with a Khan-Cake. 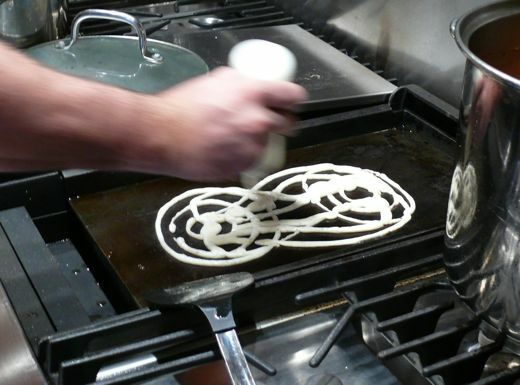 No, this is a pancake inspired by the mathematical certain non-orientable surface... you know a surface with no distinct "inner" or "outer" sides. A Klein-cake. Yup. That's how we roll in the A.M.
Not to out do Geoff, but I too dabbled in the realm of mathematical polyphysic-calculated with integer coefficients thingy. It's pretty much a familiar yet confounding paradox of heat with doughy snowiness. Maria ate it before we could calculate it's relative parameterization. Oh well. Back to basics. 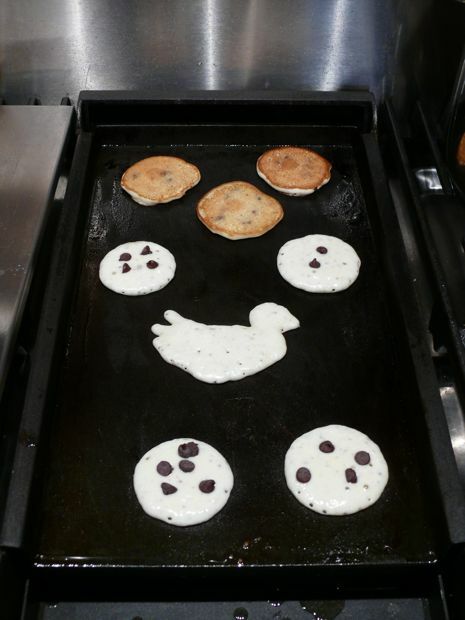 Hencakes. 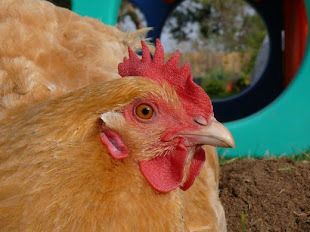 Hencakes, with added flax seed, will brighten your day. But what about the Christmas Extravaganza? I was just feeling really perky and excited, because I accomplished so much today and it kind of feels like it will all serve to make this Christmas the best ever. That is all. Thank you, and Good night. BTW, I'm totally digging that grill you have at the bird house, you lucky ducky! I don't know what happened to the first comment I tried to post--I must have hit "preview" by accident. Anyway, I got a big kick out of this post! Isn't the squeeze bottle method fun?! giggle, love the hen cakes. What do you steam your tamales in? 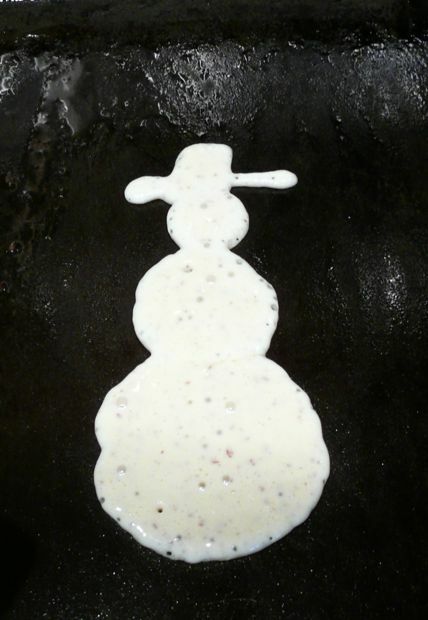 You are making me hungry for pancakes! Like that bird cake, and all the rest! YES -- the best Christmas EVER!! Always. The rain was wonderful, I too enjoyed it so very much. :o) What yummy looking pancakes! :o) It has been a while since I last had pancakes and these are making me hungry for them for sure. Christmas is only a few days away and I know the kids can hardly wait. Wishing you the most beautiful Christmas ever! Wow! Those are some Amazing pancakes. totally getting squeeze bottle, those are the best pancakes ever! 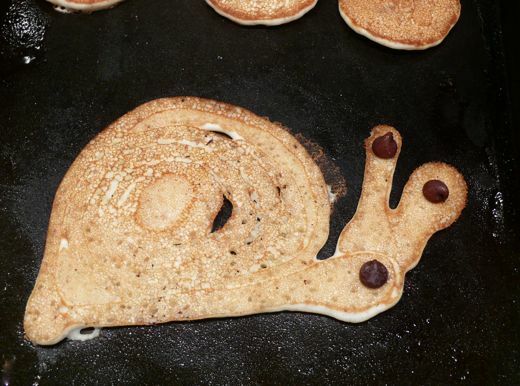 Love the slug or snail pancake! I got a new griddle for Christmas! 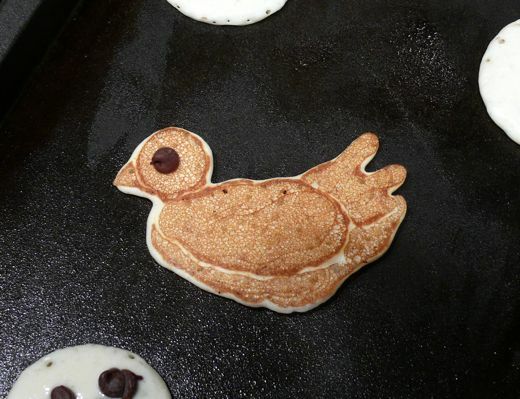 I have to make hencakes!!! Love them.